Britax Holiday Double Travel Bag gives you convenient carrying storage for your Britax Holiday Double Pushchair. Why should I buy the Britax Holiday Double Travel Bag? Britax Holiday Double Travel Bag is for carrying your Britax Holiday Double Pushchair around in. Once folded into the bag you can carry your Holiday Double Pushchair in one of three ways. You can wear it either on your back, over your shoulder or in your hand. The whole bag is fully washable and lightweight. The fabric is durable and it has comfortable padded straps. The strap are adjustable depending on your height. You can alter the straps whilst wearing the bag on your back. Then this leaves your hands free which is really convenient if travelling on public transport. 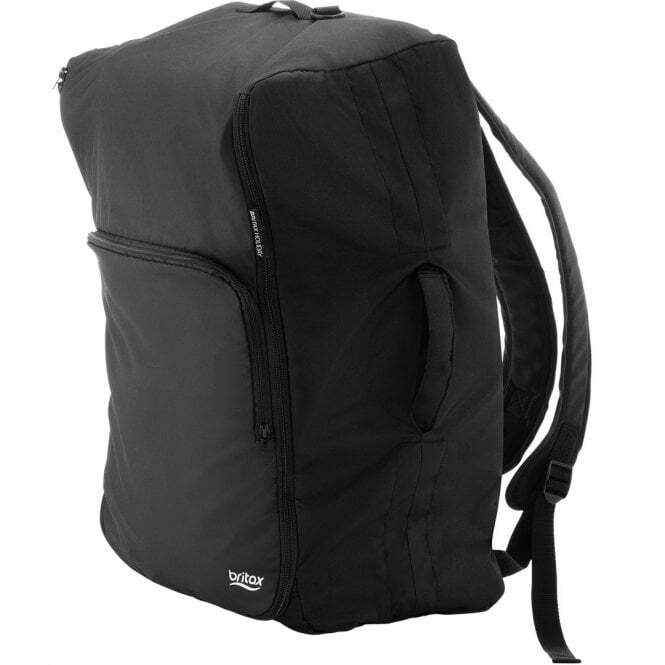 The shoulder strap and padded side handle are useful and versatile. The Britax Holiday Double Travel Bag pushchair accessory also has a storage pocket for handy items you might need whilst out and about. Available for these products: Britax Holiday Double Pushchair.